I’ve talked about New Year’s resolution on the blog before. Every year, I love to sit back and reflect and take a look at how things are going, what I need to improve, and how I can be a better me. I always do this for three areas of my life. I like to reflect me as a mom, me as a wife, and ME. Goals and resolutions are great to have, it’s great to challenge yourself spiritually, physically and emotionally. So for today, I wanted to share with you guys my New Years Resolution that I have for me as an individual (also, stay tuned this week, Jordan and I will be sharing our marriage resolutions). But before I do that, I just wanted to talk about my outfit. I love this faux fur vest (on sale and not many sizes left!) I got in the mail from Trendsend which is Evereve’s subscription box made for moms. Us mama’s don’t always have tons of time to shop, so Evereve came up with Trendsend. Trendsend is a monthly box (you can select how often you want to receive boxes) curated to best match your style profile. In each box, you’ll get 2-3 full outfits. You can keep what you like and send back the rest with the complimentary return bag. Easy right? Check out more here. This faux fur look may be my favorite winter outfit to date. I love the simplicity of the look; it’s not a lot of colors, it’s comfy, cozy and cute! 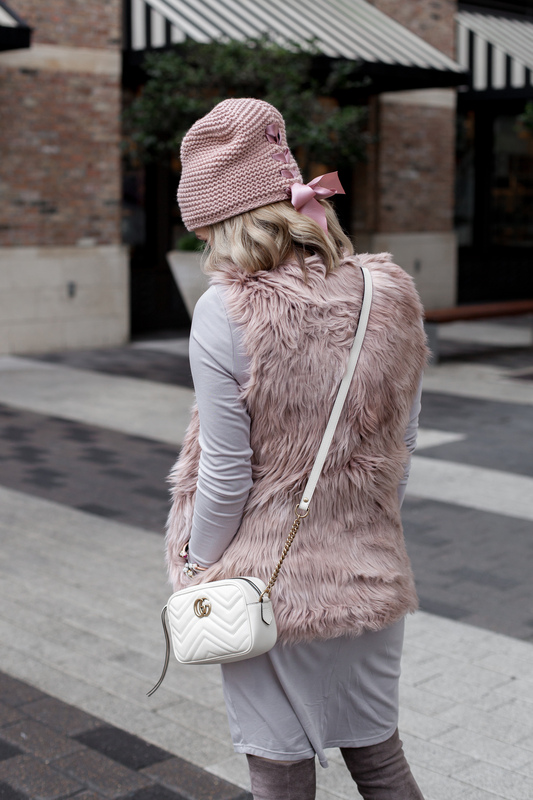 I also love pink and grey together, it may be my favorite color combo after this outfit! Read one book once a month. Read through the entire Bible 2x this year. Learn to let go of the small stuff. I tend to get uptight and let the little things get in the way. Manage my time better. I have no idea how this works with three kids! Go on more lunch dates or even girls night out. Join a Bible study group. For the longest time we were the ones to host Lifegroup, but with three kids now, that season just isn’t for right now. I desperately need to find a woman’s study group around me. Be more present. I tend to worry or think about the next thing, where to go next, what to do, check off my to-do list. It’s always go, go, go. It’s really distracting the present. I am excited about 2018. Not because 2017 was terrible, but I’m hopeful that God will do GREAT things in 2018. I pray that 2018 will be a great year not only for me but for you and your family! Do you have a New Years Resolution? What are some of them? Share below! I hope you enjoyed this faux fur vest outfit. Your beanie and bag are such a perfect accessories! I also think that I could do better this year at managing my time more wisely and also reading 1 book each month. I check the related topics and the store! Omg I love them!